Stadium Financing 100% School Financed. Construction Managers Mion Construction Company, Inc. Regarded as one of the toughest arenas for opposing teams in the Atlantic Coast Conference, the Alexander Memorial Coliseum on the Georgia Tech campus has been the home court for the Yellow Jackets for more than 50 years. Blessed with excellent sightlines and 9,191 seats that are all close to the floor, there is no better facility in the nation in which to see a game. Dubbed "The Thrillerdome" as a tribute to the many dramatic finishes to games there in the Atlantic Coast Conference era, the Coliseum has undergone three major renovations since 1986. The last major project, completed in 1996 with the help of $5.5 million from the McDonald's Corporation, involved many structural changes designed to transform the historic arena into a modern, functional and comfortable facility with virtually every aspect of the interior and exterior upgraded. 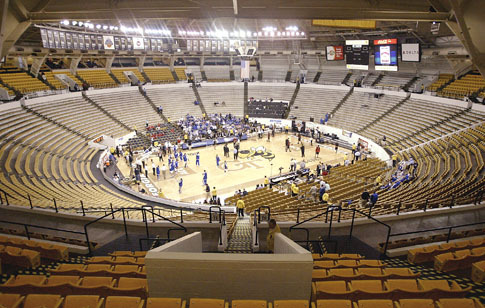 Prior to the 2002-03 season, standing room areas for students were added on the floor of the Coliseum behind each basket, helping to create even more of a homecourt advantage for the Yellow Jackets, and more premium courtside seating was added behind the scorer's table. New scoreboards were added, as well as new "Buzz Vision" video boards. Since its opening in 1956, the Coliseum has grown in capacity from less than 7,000 to its current 9,191. The venerable arena has hosted some of the best basketball played in the South. From Roger Kaiser's laser-like jump shot to Rich Yunkus' unstoppable scoring to the modern-day excitement of ACC battles, Alexander Memorial Coliseum has lived up to its nickname of "The Thrillerdome." Alexander Memorial Coliseum also served as the boxing venue for the 1996 Centennial Olympic Games and was to the Atlanta Hawks of the NBA for the 1968-69, 1969-70, 1970-71, 1971-72, 1997-98 and 1998-99 seasons. The nine-month, $13-million re-creation began immediately following the 1994-95 season and was completed in January of 1996. The Tech men's and women's basketball teams christened the recreated facility on Jan. 20, 1996 with a doubleheader against Virginia. Playing before a sellout crowd of 9,675, the Rambling Wreck downed Virginia, 90-70, in its inaugural game at the recreated Thrillerdome. The Jackets, who played the early portion of their home schedule at The Omni and Georgia Dome while the renovation was underway, were 6-0 at home after returning to their campus facility. The project involved, first of all, lowering the floor by four feet to allow for increased courtside seating and improved sightlines. The tunnel entrance was rerouted from midcourt with the teams now entering the floor from a tunnel at the southeast corner of the court, which includes an elevator to the Tech locker room area. Many of the former bench seats were converted to chairbacks, and air conditioning was installed for the first time through a gift from the Atlanta Committee for the Olympic Games (ACOG) and York Air Conditioning. New scoreboards were installed, and improvements to the lighting and sound systems also enhanced the facility. Twelve luxury suites were added at the top of the Coliseum along the south side, with the possibility of adding 12 additional suites at a later date. Each suite seats 14 people. Perhaps the most drastic change occurred on the concourse level, where a much wider and more plush walkway provides for improved restrooms, concessions and merchandise outlets as well as creating a place to showcase Georgia Tech's basketball heritage. 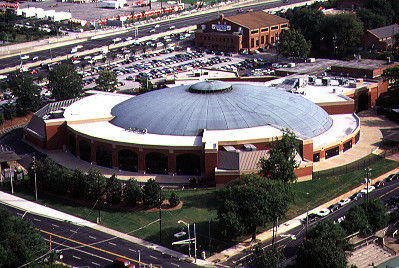 The outside appearance of the Coliseum also changed dramatically, using a brick exterior with large bay windows, but the familiar domed roof remains clearly visible. The Whack Hyder Room and the media work room were relocated from the Luck Building to the south end of the concourse, and improvements also were made to both visiting team locker rooms. The architecture firm of Smallwood, Reynolds, Stewart and Stewart was responsible for the design, while Hardin Construction was the construction manager. Alexander Memorial Coliseum also underwent a $3 million renovation prior to the 1986-87 season that dramatically changed the appearance and capacity of the 'Dome. The renovation was the first of such magnitude since the facility opened for the 1956-57 season. This first renovation of the Coliseum saw the addition of 2,150 seats, boosting seating capacity to over 9,000. The seats were made possible by the addition of seven rows of chairback seats around the rim of the Coliseum. The additional seats were built in the area where a walkway around the rim previously existed. A 15-foot wide corridor was added to the outside, which was glass-enclosed with access via portals into each of the aisles. Two new banks of lights were added on either side of the court to increase the lighting to national television network standards. Extensive cosmetic work was also done to enhance the building's appearance. The expansion and improvement of facilities continued prior to the 1987-88 season when the Jim Luck Building, located adjacent to the Coliseum, was dedicated. The two-story Luck Building features spacious locker rooms, offices and training rooms for both the men's and women's basketball programs. In another renovation completed prior to the 1989-90 season, the Coliseum added nearly 700 new seats, including courtside box seats in the end zones and on the North side of the court, and seating for individuals and media on the tunnel side. This project filled in areas on the floor level which previously were empty, and allowed Tech fans to sit closer to the court. While Alexander Memorial Coliseum has changed its look in the last two decades, Tech's winning ways at home have remained the same. In the 52-year history of the Coliseum, Tech has a 532-186 (.741) mark. The Coliseum was completed in September, 1956, at a cost of approximately $1.6 million. It was built as a tribute to the late William Alexander, Tech's third athletics director and football coach from 1920-1944. Alexander wanted to provide Tech with a physical training center for all students, but he died in April, 1950, before seeing the project completed. Alexander Memorial Coliseum was dedicated on Nov. 30, 1956, when the Rambling Wreck lost to Duke, 71-61. But Tech went on to win 10 of 14 games in its new home that season. The Jackets have posted three perfect seasons at home, including a 6-0 mark after the re-creation in 1995-96 as well as a 14-0 campaign in 1963-64 and a 9-0 slate in 1985-86. The architect for the building was Tech Associates of Atlanta. Structural engineers were Morris, Boehmig and Tindel; electrical engineer was Charles F. Howe; mechanical engineers were Donald F. Lindstrom and Associates; and the general contractor was the Mion Construction Company, Inc., all of Atlanta. The structure is circular in design with a diameter of 270 feet. Thirty-two steel ribs support the curved dome structure which weighs approximately 862 tons and covers an area of 71,500 square feet. In 1983, the roofing was replaced by two layers of material which easily expands and contracts with changes in temperature and a copper topping at a cost of $270,000. The facility was given the nickname of "The Thrillerdome" by former Tech radio announcer Brad Nessler during the 1983-84 season when the Jackets had five ACC home games decided in the final seconds, including a double-overtime win over Maryland, a triple-overtime victory over Virginia and a last-second shot to beat Wake Forest. Atlanta, Ga. - Four firms are being asked to provide their ideas about how to bring Alexander Memorial Coliseum on the Georgia Tech campus up to current standards. The venue, built in 1957, has undergone many upgrades, but officials say they have been haphazard and have left oddities such as seat treads that don't match and few fan amenities. The firms are being asked to review the building and make recommendations. That work could include removing the building's domed roof in order to make the changes. Work is likely to include premium seating, school officials say, in order to help pay for the project. The initial work is being funded from $15 million donated by Henry F. McCamish Jr. toward the arena project. Athletic department officials say there is nothing firm about the project and they'll wait until they see the firms' ideas and suggestions on how to pay for the upgrades before making any decisions. The decision on whether to move ahead will likely come this summer. The school's board of regents will have the final say. Estimates are the work could cost $45 to $50 million and no consideration has been given to building a new arena. Atlanta, Ga. - Beginning in the fall of 2012, the home of Georgia Tech's men's and women's basketball teams will be known as the Hank McCamish Pavilion, the product of a $45 million renovation and replacement project to the existing arena, according to the Atlanta Journal Constitution. "We're incredibly excited about this opportunity to reshape the home of Georgia Tech basketball," athletics director Dan Radakovich said during a news conference. "Certainly, thanks to the McCamish family for their gift to allow us to get to this point, and thank you to the (Georgia) Board of Regents for allowing us to get to this point, as well." Last week, the Board of Regents approved plans for the renovation project and gave Georgia Tech permission to move ahead with its plans. Construction will begin in the spring, with fall 2012 as the targeted move-in date for the teams. The Board also approved plans for an $8 million indoor football facility on the current practice field plot. It will be paid for by a similar donation, the newspaper reported. In addition to fixes around the outside of the building, where more greenery and park-style space is expected to be added, the arena will feature three entrances. The parking lot entrance will be designed for members of the club seating only - an 800-seat total area on the side opposite the team benches where club members can enjoy the game. There will be two club seating areas, Radakovich said. One will seat 500 seats, and another will seat 300, while other spectators can cross through the club through a single main concourse. Inside the arena, the court will remain the same, while the current concourse walls will be knocked down so as to give spectators more opportunities to see the floor while walking to restrooms or concession areas, the Journal Constitution reported.